Would you support the Pedelec Community in the purchase of a community spot-welder & part sourcing? I posted this in the battery area, maybe this is more suitable. Out of warranty battery replacement costs are pretty horrendous for all e-bikes. This has led to a plethora of youtube videos of doubtful provenance and not too much emphasis on safety procedures. This Israeli guy knows a thing or two about the technology and his article is a very informative and practical guide to replacing your own cells. His advice on not going for the cheapest but the safest and best option seems to me very good advice, much better than many youtuber's hairbrained and dangerous examples out there. The only problem is the cost of a spot-welder suitable for the job, maybe the Pedelec community can ask for donations and we can all club together to buy one for the community to enable it to be sent on loan to members for a small fee and the shipping costs. Further to this, perhaps a supply of the nickel strips and large shrink-wrap can be made available to members. Just an idea to put out there-not just for the Freego but all pedelec batteries post warranty. There is a lot of unused talent out there in our community. Surely the Pedelec community can be a route to many people avoiding the pitfalls of DIY battery replacement, with guidance from tech-savvy people on here assisting. If we can demonstrate how it can be done safely and at a large discount to the normal battery replacement sources why wouldn't the Pedelec community support such an idea? As a community we must show them a better way, by supporting them in their DIY efforts, sourcing good quality materials and batteries, then helping them as they build their own battery packs SAFELY. Insat (sp) will recell most battery packs I believe. Personally I can see the upside of diy but it can also go very wrong..
Generally not a good idea unless you have knowledge of battery building, also the ability to test and match new cells to each other and weed out any poor ones. In the long run cheaper and better to buy one from a reputable vendor or get Jimmy at insat Intl to build a new one or recell an existing one with new pucker cells all individually checked. I agree it's not for the total newbie, but we were all one once. If you carefully review the video you will see his testing of batteries and purchase only of good quality types precludes the necessity of having to match them, I think he said at one point all the cells in a batch were perfect to within 100th volt. fixing batteries is a very time consuming job. I can't see the upside unless you are forced into having to fix it. If a new identical battery can't be found, it's much easier to wire in another rack battery or downtube battery or even battery in a bag than trying to replace a single dead cell. That's the upside-we older farts have time to spare. The video didn't advocate repair of individual cells, just a how-to on replacing the lot with good quality new cells and BMS. I suppose it would be up to the user, replace an individual failed cell if the battery is good otherwise, but I suspect most will want to do the lot while it's apart. The upside is that it will de-mystify the whole area of this battery technology for the community which has become a prime target for misinformation on the net. Incidentally, did you ask Whoosh if they have a loan folder? yes, I did. They don't have stock of zephyr CDN at the moment. Thanks anyway, no hurry as long as it's available before our Euro trip. The only problem is the cost of a spot-welder suitable for the job, maybe the Pedelec community can ask for donations and we can all club together to buy one for the community to enable it to be sent on loan to members for a small fee and the shipping costs. This is an excellent way of going about DIY battery building, it makes my OP suggestion obsolete. I particularly like the community feel to it all. I am thinking of building my own from scratch, the Freego Eagle just doesn't have the oomph of my earlier Whoosh Sunbear, and this could be my ticket to a battery build. Thanks for the post gwing3. Check out the Vruzend threads on here diy solderless 18650 kit and endless sphere for a cheaper low power alterative there's a few you tube videos and the Israeli guy is their american distributor. I did a forum search on Vruzend and it returned nothing other than your post. Do you have a link you can provide? 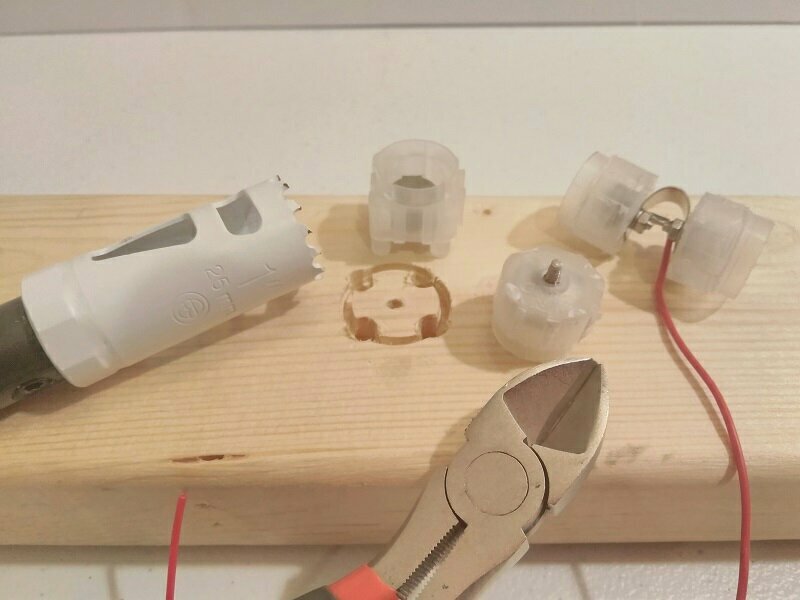 I don't know how to post links.try google diy solderless 18650 battery kit pedelecs /endless sphere. Nkon.nl now sell the vruzend kits overall the price inc p&p is a bit cheaper then direct from India. The problem with all these battery kits is that you end up with a block-shaped battery. That's OK for some other battery applications, but not ideal for a bicycle. Yo can buy a complete battery in a case with a proper mounting for the same price as the cells, BMS, etc., so not really much point in making your own. This guy is trimming them down to fit inside a tube.